Earlier today it was announced that the unbeaten Filipino Adones Cabalquinto (15-0, 8) has been forced out of his proposed bout with Japan's Keita Obara (10-1, 9). The bout, which was set to be for the OPBF bout, has sadly been forced off and Cabalquinto won't be able to make the most of the opportunity that he appeared set to get. Thankfully Obara will still be in action on the card and will still be able to claim the OPBF title himself as he meets replacement opponent Jay Solmiano (17-2-1, 13), also from the Philippines and also, like Cabalquinto, a southpaw. Ranked #1 by the OPBF Obara is a former Japanese champion who was ear marked for success early in his career. Although he lost on his debut he has quickly rebuilt his career with 10 straight wins and has never gone the full schedule of a fight de to his power*. In those 10 bouts he won the Japanese title and defended it twice as he rose through the ranks to become one of the top 25 Light Welterweights according to boxrec and a top 20 fighter according to the IBO. Proposed opponent Cabalquinto was the OPBF #2 ranked fighter and had a perfect unbeaten record. Unfortunate though Cabalquinto hadn't really faced anyone of note with his best wins coming against Dan Nazareno Jr, Jaypee Ignacio and Romeo Jakosalem. In Solmiano was actually have the OPBF #3 ranked fighter and although he has two losses he has faced the better opponents than Cabalquinto. The most notable name on Solmiano's record is Nihito Arakawa who narrowly beat the Filipino in 2011 in a split decision. Having seen more of Arakawa since then it's fair to say that Solmiano isn't a bad fighter at all. Although this is a fight with a "replacement" we've got to admit it's still a really good bout and not one that we can complain about getting. It's a great match up and the winner should be on the verges of a world ranking. For a while we had known that Yohei Tobe (7-1-1, 4) would be fighting for the vacant Japanese Super Flyweight title, recently vacated by Teiru Kinoshita. What we didn't know was who he'd be fighting for that title on April 14th. Tobe's opponent was named earlier today as Taiki Eto (12-2, 9), the twin brother of former WBA Super Flyweight interim title holder Koki Eto, in what appears to be a fantastic match up. Tobe, whose sole loss came to Ryo Akaho, once looked like a nailed on future world champion. Unfortunately his career hit the rocks in 2012 with the loss to Akaho and then a draw with Richard Pumicpic in early 2013. Since then however he has scored 3 wins and got himself a mandatory title fight. For the 25 year old Taiki things have been equally as interesting. 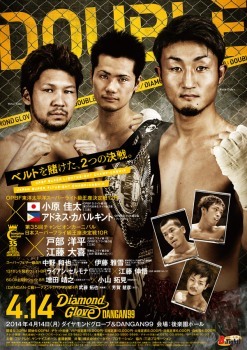 He, like Tobe, was tipped for big success before suffering a stoppage loss, in his case to Takeo Kuranaga. Since then Taiki has rebuild his career with notable wins over Konosuke Tomiyama, Isack Junior and Ali Rochmad. Unfortunately Taiki, like Tobe, suffered a loss in an OPBF title fight, suffering a close decision loss to Artur Villanueva in a real barn burner. With this match we expect something very special. Both guys have limited defense, plenty of power, an open style and the the knowledge that this bout is one they must win. Another thing we hadn't known was that the card would have a second title fight added to the card. The bout we've had added sees former Japanese Light Welterweight champion Keita Obara (10-1, 9), pictured, fighting against unbeaten Filipino prospect Adones Cabalquinto (15-0, 8) for the vacant OPBF Light Welterweight title. 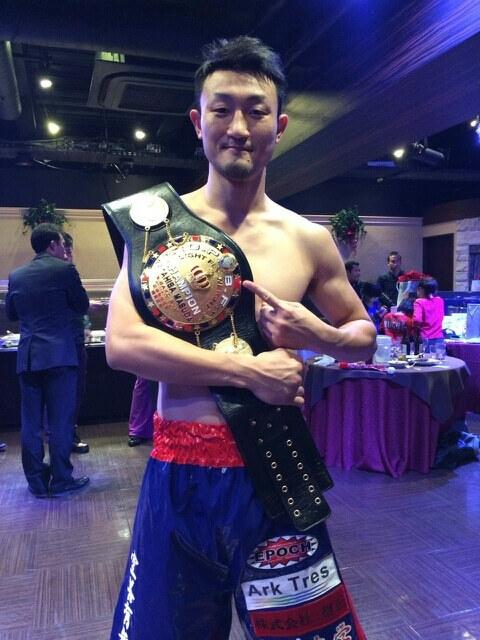 Obara, who is now on a 10 fight winning streak after losing on debut, defended the Japanese national title twice before vacating it to move up to the OPBF level. In Cabalquinto he'll be meeting a very good fighter who is the current GAB champion and holds notable wins over Dan Nazareno Jr and Romeo Jakosalem. The belt, which was recently vacated by Korean Min-Wook Kim, will see a new champion crowned for the first time since May 2012.